To be fair though, this batch may look adorable but my first batch were kinda scary looking. Sinister even. 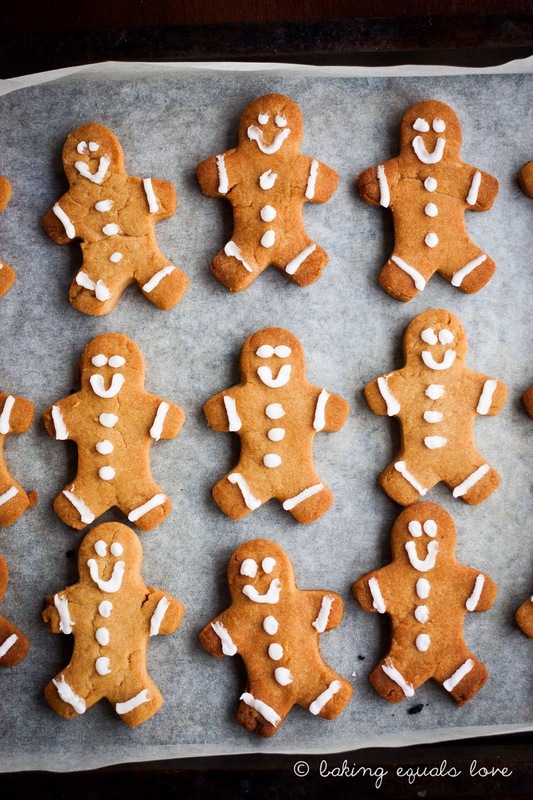 Apparently there is a technique to not making your gingerbread men look like psychos. Took me an entire batch to work that out but there you go. I think it has something to do with the wonkiness of the eyes. Anyway, like I said before these are a cinch to make. Melt and mix and then pat out flat. Bake and decorate with icing in a ziplock bag (or not) and Bob’s your awkward uncle who gives novelty G-strings at family secret santas. True story. You probably even have most of the ingredients already in your pantry: butter, flour, brown sugar, ground ginger, cinnamon. Talk about convenient and great for last minute panic baking aka me tonight. 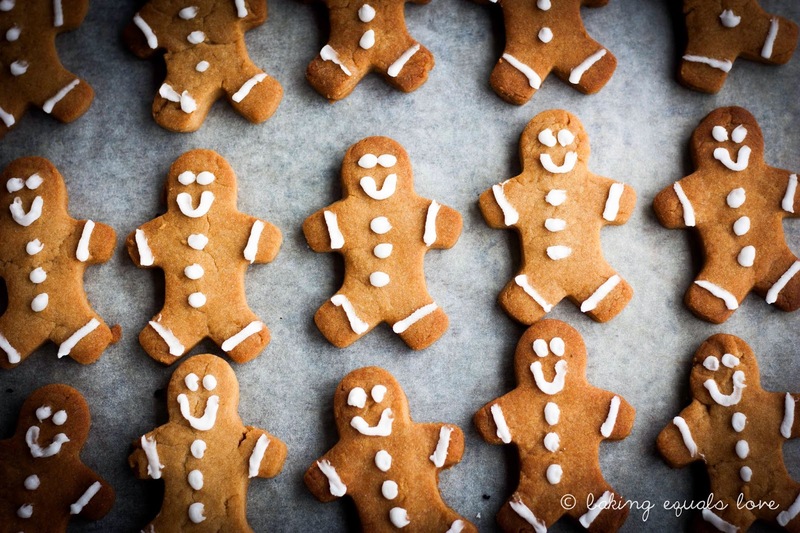 They are gingery and cinnamony and gorgeously crisp! Kinda reminds of a gingernut cookie. Perfect with a cuppa. 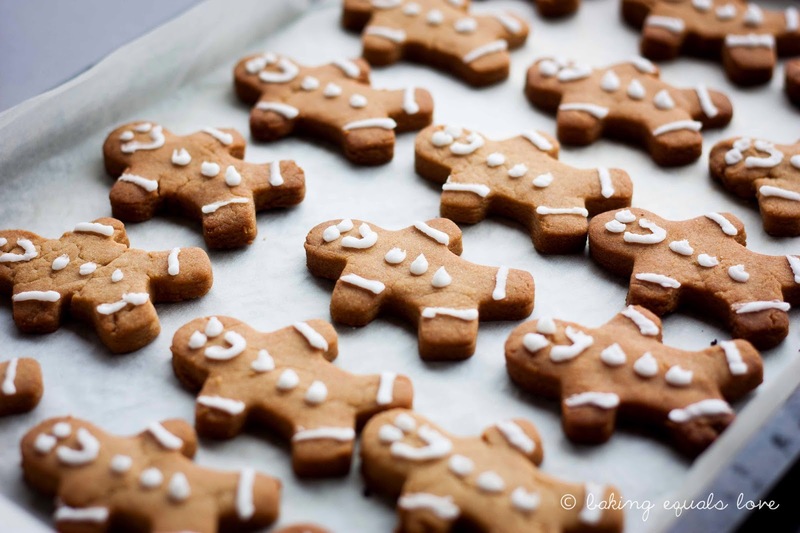 Need to give a shout out to cousin Anya for putting me on to this recipe – her and her gorgeous girls made these as matariki gingerbread stars and I was totally blown away by them! Cheers Anya! Adapted from this recipe, thanks to Anya for recommending! 1. Preheat to 170oC (150oC fan bake) making sure the rack is in the middle. Line three baking trays with baking paper. 2. In a small saucepan, melt butter, golden syrup, and brown sugar over medium heat. 3. In a large mixing bowl add flour, baking soda, salt, ginger, and cinnamon. Whisk well getting rid of lumps. Make a well in the middle and pour melted butter mixture into the dry ingredients and mix with knife to form a dough. Knead lightly to form a smoothish dough. I found mine to be a tad crumbly to start off with but came together with a bit of squeezing. 4. Take half the dough, roll into a ball and flatten into a disc. On a flat surface between two pieces of greased baking paper pat with your hands or roll out with a rolling pin to around 5mm thick. 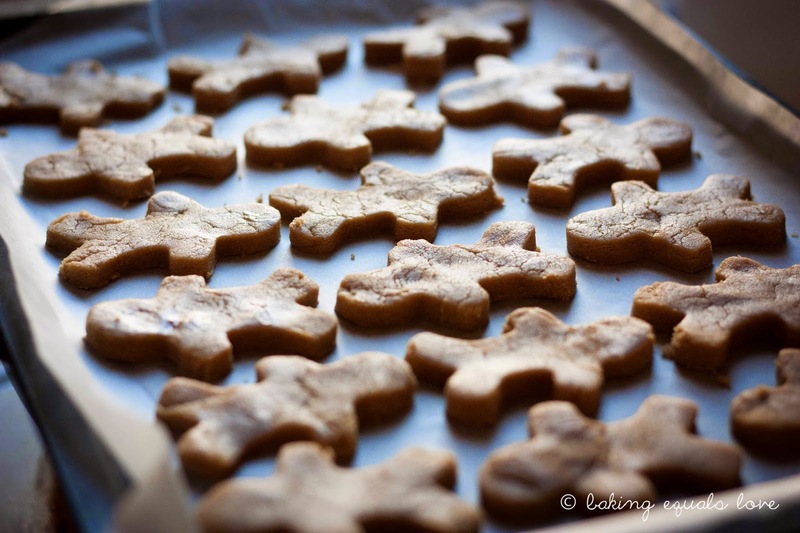 Use your cookie cutter and cut out the gingerbread men and place gently on prepared baking tray. You can get away with putting the cookies quite close ~ 1cm apart because they don't spread (This is total conjecture but I reckon it might have something to do with the butter being already melted). Squeeze the off cuts together, add a chunk from the remaining dough and roll out and cut out again. Repeat as many times you need to finish up the dough. 5. 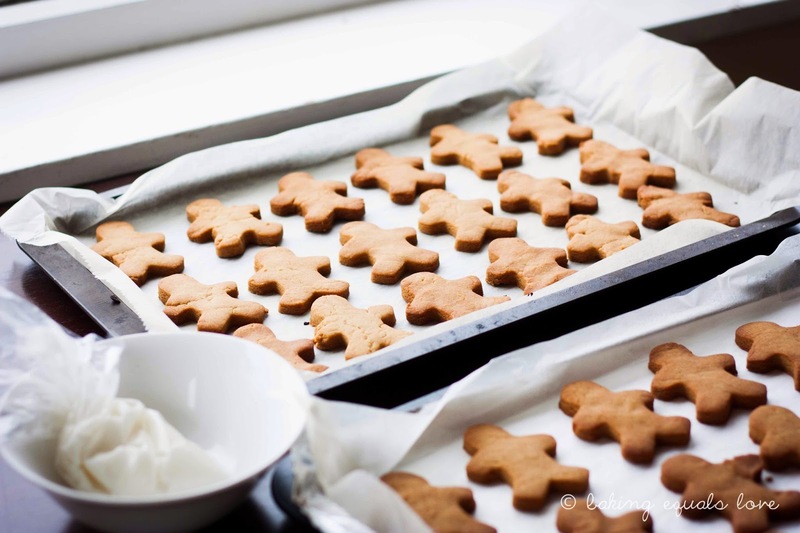 Bake one tray at a time for 10-12 minutes until a tanned colour. Err on the shorter side as they can burn easily especially if there are a few slightly thinner ones. Allow to cool on the tray for around 5 minutes before transferring on to a wire rack to cool completely. They will crisp up on cooling. Decorate only when completely cold. You can also leave them plain of course and they will be just as tasty. They are best the next day when the spices have had time to develop, yum! 1. Put the royal icing powder in a small bowl. Add 1/2 a teaspoon of water/lemon juice at a time until you get the a pipeable consistency (aim for toothpaste consistency). You want it to keep its shape and not be too runny. Add more powder if too runny, more liquid if too stiff - a tiny bit of liquid goes a long way though so be careful! 2. Spoon into one corner of a ziplock bag and twist down. Snip a little hole off in the corner. Pipe on your eyes/buttons/arms. Eat the ones that look too scary. *To get rid of any spikey/sticky-uppy bits: Have a little dish of water and square of kitchen paper next to you as you pipe. Wet a finger in the water, dab off the excess on the kitchen paper and use your damp finger to lightly push down any spikey bits. 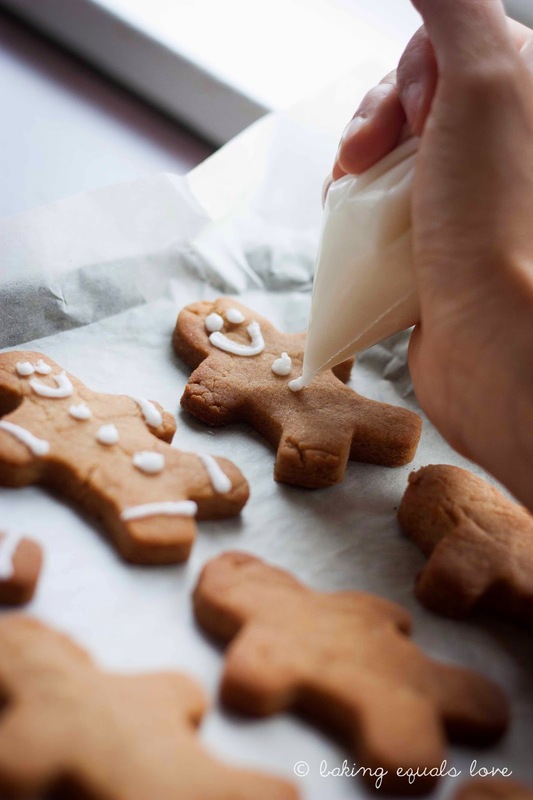 The icing starts to dry pretty quickly so do this to each gingerbread man as you go (rather than all at the end). *Although the icing will start to harden almost right away, it does take a couple hours to harden completely. So to gauge whether the icing has hardened completely yet, after I've iced all the cookies, I draw a short line of icing on a piece of baking paper and use that to test whether the icing has dried. *From what I understand, if you make your royal icing with royal icing mix or meringue powder this contains pasteurized egg whites and is safe for elderly/young/pregnant women/immunocompromised. If you're using a royal icing recipe that contains raw egg whites, this is not safe for elderly/young/pregnant women/immunocompromised. *The % of egg white to sugar in any royal icing recipe dictates how hard it will harden: the more egg whites the harder the icing will be. So if you are adding icing sugar to adjust consistency just be aware that this may affect how hard the icing will dry.